I'm really not justified in making this a completely different topic, since it's pretty much along the lines of #4. Hence, I numbered it "4A." What compelled me to add a 4A to the list was that I actually saw my advice put into practice and therefore was able to judge my suggestion via a real example and not just as conjecture. Here's #4A: Make characters and conflicts relatable. Okay, now this, I think, is a fine line to walk, especially for DC. I've read hardly any Marvel comics, but I get the impression that many conflicts residing in the Marvel Universe are of the "mundane" or "everyday" variety. Which is why I think Marvel heroes have been stereotyped as being angsty/whiny/emo, I guess. Anyway, one of the basic rules of storytelling is to make the main characters relatable, a.k.a. identifiable, a.k.a. empathetic. Meaning, there's something about them that "rings true" to real life: they've undergone tragedy, they want the same things we want (justice), their personality type is similar to us or someone we know, they desire something despite great odds, they're in a situation we've been in before, they've made the same mistakes we have, etc. The same rules of audience identification hold true for villains, as well, and in fact, a great villain needs to be relatable to be a great character. If we understand his or her motivations, even if whatever he or she does is completely horrible, then we're invested in that character, no matter how evil they are. One key, I think, to helping readers identify with characters is to keep motivations and situations small. It was Josef Stalin who said, "one death is a tragedy. A millions deaths is just a statistic." The vast majority of us don't have experience (thank goodness) dealing with millions of people dying on an everyday basis. And even if we were living in some region embroiled in a holocaust resulting in the deaths of millions, we couldn't process that many tragedies in our minds; what we probably would remember are the specific people affected. Great storytellers know the power of the particular, which is why anyone who's seen Schindler's List can never forget the little girl in the red coat. ...where Booster, when recklessly pursuing a villain, accidentally killed a little girl's dog. Yep. I was pretty upset. Few of us have seen a planet explode, but I'm sure many of you have experiences with the passing of a family pet. See? Instantly relatable. Oh, and remember the end of I Am Legend or Old Yeller? By finding the everyday and putting it in context of the fantastic, the writers have established an emotional tether to the reader. Now, because this is an instant touchstone to reader reaction, it can be misused. 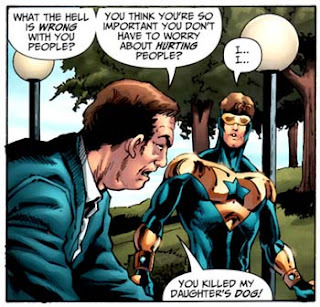 It wasn't misused in Booster Gold, becuase it served the purpose of the story. The fact that it was accidental added even more to the pathos, and our hero learned a lesson from it. However, you can't kill off innocents gratuitously like was done in Cry for Justice, or the only affect you will have on the reader will be to anger them. I'm not saying that every comics writer should go out there and put a small animal in peril to engender audience sympathy. I'm just using the example of a pet in danger because it's something most of us can relate to. There's plenty of other things that writers can come up with to connect with readers. And that's also not saying comics should be mundane, either. "Small" conflicts--universal situations that we can all identify with--can be used in spectacular, epic stories as well, and in fact should be used, or else there's no soul. That's why the original Star Wars worked and the prequels sucked. Just a "little" food for thought for all you aspiring comic writers out there. I agree. Booster tries hard, and is allowed to royally screw up in ways Superman or Batman aren't allowed to (not that I'd want them to), but has had enough heroics to keep him form being a total joke. You know, I think that's the real reason I like him, m.c. The modern Booster represents that part of us that, no matter what we do to make things right, we always manage to screw up royally. Yet he still keeps on trying. It's an admirable quality. Either that or it's just the shiny costume. What can I say...I like shiny. Oh, and the robot sidekick. I love Skeets. He reminds me of K.I.T.T. if you want real life everyday occurences in your comics pick up gotham city sirens #11. It's good. tis only a pity they changed the artist. if you are interested please email me on paicomics at yahoo dot co dot uk. Saranga, I just read Gotham City Sirens #11 today! More trouble for dogs, it looks like. :( I have been enjoying that book quite a bit...I'm a big Harley fan. As for the second part of your comment, check your inbox. :) I'd love to be a part of your blog. It looks like maybe I should put an e-mail link here. Sorry about that.